The Barstow’s are pretty English through and through. But on my Mom’s side I’ve got a little Polish, and I’ve got a pretty terrific grandmother too. This weekend, my Meme (yeah that’s not Polish, that nickname is all French! ), taught me how to make golumpki, a traditional Polish dish. Golumpki are cabbage rolls filled with ground pork and ground beef and topped with sauce. 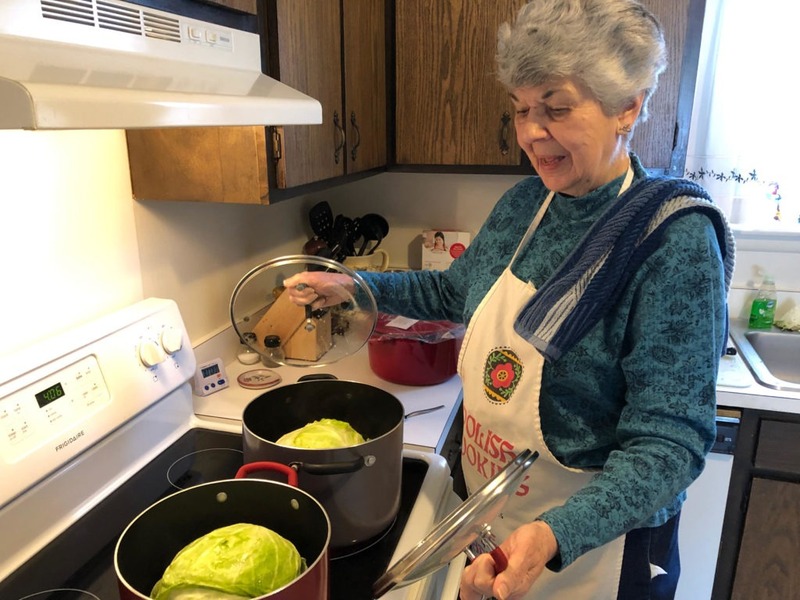 To begin, you boil the cabbage heads until the leaves start to just fall off. You de-vein the leaves so they’ll roll easily and put them to the side. The pork and beef are mixed together with rice. Naturally we used the best beef around – Barstow’s farm raised Absolutely local, absolutely delicious TM beef! Don’t forget to line your large roasting pan with the cabbage leaves that are ripped, too small, or too large. The set up is really what takes the longest. Those damn cabbage leaves don’t want play and the rice takes ages, but once you have all of your ingredients prepped, things really get rolling – literally! Take a fistful of beef and roll it into a cabbage leaf. Line your roasting pan with your small army of cabbage twinkies and top with tomato paste. Stick it in the oven for a couple hours and bon appetit…. er smacznego! Meme pointed out that so many of the foods our ancestors made were very labor intensive and very inexpensive. It’s true! I think of how long it takes Shannon to make all the lasagnas ordered around the holidays. And how many hours and hands it takes to prepare the dozens of pierogi we sell at Barstow’s Dairy Store and Bakery. Pasta, sauce, potatoes, cheese – not very expensive, but lots of labor and lots of love. A labor of love! That’s precisely how I felt digging into the golumpki I prepared together with my Meme. I’m grateful to work with and live so close to my family members. To be able to learn from them, thrive in their support, and sustain a multi-generational connection to the place I call home.